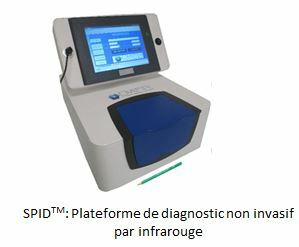 Diafir, based in Rennes, has developed the SPIDTM platform for non-invasive diagnosis using infrared imaging. Using patented optics and proprietary algorithms, this platform allows the reading of a metabolic fingerprint using a single drop of blood or body fluid. Current developments include screening for NASH (non-alcoholic steatohepatitis or fatty liver) and for septic arthritis. Diafir plans to commercialise SPIDTM on completion of extensive clinical trials by 2020.